Here is some background information which will help those new to the Obi Obi campaign understand why the largest protest in recent Queensland history occured in our small rural community in 2004-2005. Together with the other information contained in this website, and the DVD-ROM we also have available, you will have the full history of what we still regard as a great injustice which took place in our small community. Early in 2003 Boxsells (Stock and Station Agents, Auctioneers and Real Estate Agents) let it be known that they were going to sell the livestock saleyards which they had run for many years in Maleny. These saleyards were located on a bend of Obi Obi Creek right next to the only pub in town. A few years prior to this the Caloundra City Council had undertaken a review of the planning scheme for Maleny and a portion of the two lots making up the site was rezoned as open space in the then new Maleny & District Development Control Plan. The intention by the Council and townspeople involved in the planning review was for a strip of parkland to be created along the bend in Obi Obi creek. As any good developer knows, there are cut off dates and sunset clauses for planning schemes - get in with a development application in a timely manner and the new planning provisions will not apply to you - however they will apply to anyone acquiring the land down the track. Part of the reason Boxsells decided to sell the land in 2003 was to get it into the hands of someone else while they could still use all the land for development - for Boxsells it was a commercial decision to maximise their profit on the land sale, nothing more. At that time in early 2003 few in Maleny had any real understanding of the planning scheme, or the fact that a developer could get in under the sunset clause provisions and do a development against the wishes of the local community. Thus no-one really noticed when the land was put up for sale and quietly purchased by Cornerstone Properties Ltd, a development company based in Brisbane. At this time a couple were renting an old Queenslander house situated on the land owned by Boxsells, right next to Obi Obi Creek and next to the livestock saleyards. Jon Woodlands and Jan Duffield were told by Boxsells that the site was being sold and their tenancy would be ending. Jon and Jan were well aware of the special nature of the bend in Obi Obi Creek, that numerous platypus burrows were located on the land and they became concerned over the likely outcome for the site if a redevelopment occured there. Maleny is situated in one of the fastest growing regions of Australia. Located in the hills behind the hinterland of the Sunshine Coast, around 40 minutes from wonderful beaches, 90 minutes from Brisbane city and the international airport, wonderful green rolling hills, nice climate. A very desirable location. An area ripe for large grocery chains seeking new markets in their ever expanding empires. The developers who purchased the former saleyards were aware of this growth and they most likely made overtures to the two national chains Woolworths Ltd and Coles Myer Ltd. Woolworths corporate headquarters decided that Maleny fitted their location parameters for a new store and the deal was done. A few people got together when word got out that the saleyards had been sold, some placards were made, a notice went into the local paper promoting a gathering and soon the word was out widely in our community and a protest movement was born. Planning Scheme Ignored. Many people were upset that an outside company could come into our town, and do what they liked in order to make a profit - totally disregarding the wishes of the local community embodied in the new local planning scheme. Vibrant Habitat Destroyed. The land occupied an inside bend in Obi Obi Creek. The ground was low, alluvial, flood prone and not an ideal place for any development. The soft earth made an ideal location for a complex network of platypus burrows. A good range of native trees were situated on the creek bank (admittedly interspersed with foreign weed species). The area was a vibrant habitat which would have made a lovely addition to the creekside parkland in our town. Inappropriate Location For a Large Retail Business. It is important to note that no less than four other large vacant sites existed in 2003, any one of which could have been used for the development. The development site was located right against the only bridge over Obi Obi Creek, was just 200 metres from the local primary school, was in a known traffic bottleneck area, was in a location where little could be done to improve traffic flow, and was located right on the creek bank. The site was also separated from the rest of the retail businesses on Maple Street, necessitating people having to walk a considerable distance to visit other shops, or move their cars twice on each shopping trip. Over 70% of local people surveyed said the site was a poor choice for a supermarket. Cornerstone bought it because it was cheap ($600,000 when the best site in the heart of Maple Street was being offered for several million dollars). Heavy Handed Site Clearance. The development company, Cornerstone Properties Ltd, made the regretable decision to employ the Deen Bros demolitions company to conduct a commando style early morning site clearance when it became apparent that there would be local opposition to their intentions to develop the former saleyards site in Bunya Street. The way they smashed down trees with excavators and scuffled with demostrators won the developers few friends in Maleny. That action alone caused many to join the protest campaign. Riverine Land Compromised. In this era of drying climate in Australia we are more than ever aware of the importance of water, catchments and what creates healthy waterways. State Government legislation existed to protect riverine areas. At the heart of our protest was the issue of the legal standing of a company to clear land and construct a building in a riverine area. On 14 September 2004, a court-case judgment was made in favour of the developer. That is, they could remove native trees on, and below, the "high-bank" of the Obi Obi Creek. They could also build within that area as long as they did not interfere with the flow of the creek, even during floods events. The plight of the platypus colony was ignored as the animal was not deemed an endangered species. The term 'acceptable collateral damage' came to mind. The general mood of Judgment showed very little respect for the waterways in small rural townships. (This same Court had recently issued another Judgment in favour of a developer over the Caboolture Council). Unwanted Large Chain Store. Many people chose to move to Maleny for the small town atmosphere, and the LACK of any retail chainstores or franchise fast food outlets. Woolworths was known to employ poor social responsibility practices, was known to exploit primary producers by wholesale buying power pressures, was known to begrudge providing independent truck drivers all but a borderline profitability in shipping their produce vast interstate distances, was known to undercut smaller competitors with the intention of removing them from the market place. For many, Woolworths was most unwelcome in our town irrespective of where they were located, for some it was only the creekside location that was the issue. 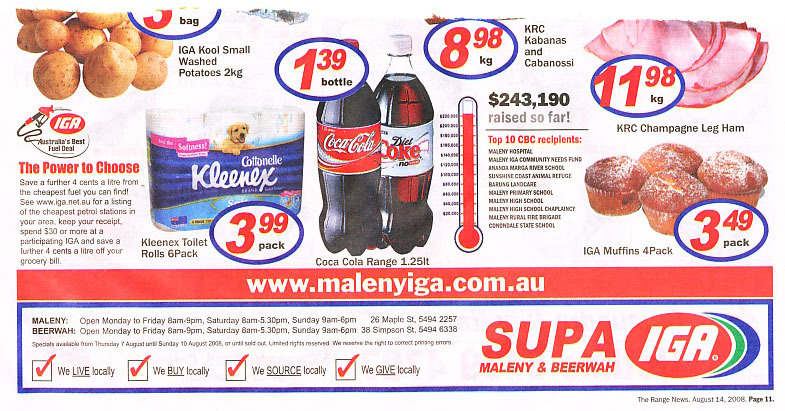 Our locally owned IGA supermarket donates more that ten times more per annum to our local community than the average Woolworths supermarket does, and the IGA buys from local growers. Overbearing Police Presence. Many in our community thought that the Police numbers who were sent to Maleny on and after 14 April 2004 site clearance day were excessive. Ironic was the state government decision to send in over twice as many police 15 months later when protesters were forcibly removed from the development site. Government Siding With Big Business. It was almost awe inspiring how quickly the Queensland Premier fell into line with the wishes of Woolworths Ltd to sort out the little issue of Maleny. Clearly on the side of big business all of the way - Police Minister, Local Government Minister, Deputy Premier, Premier, Planning & Environment Court Judges, etc etc. Clearly keen to see big business protected, the pro-development ethos preserved, the conservative nature of Australian society restored ASAP, with a token bit of post-event legislation amendment to 'close the loop holes'. Read this ABC Radio National transcript from the Life Matter program. It gives an insight to the thinking of Maleny residents at the time. Soon after the trees were ripped out on 14 April 2004 Woolworths executives panicked. They were not expecting any controversy over their supermarket expansion plans. In some areas the announcement of a new supermarket was a cause for community celebration... The swift escalation of media interest, and the articulate and knowlegeable people from Maleny fronting the media over the issue sent alarm bells ringing at Woolworths Ltd headquarters in Sydney. Out of the blue an offer came from Woolworths on 19 April 2004 to sell the site to the Caloundra City Council. This seemed odd as Woolworths was not the property owner, just the contracted tenant. Passing the hot potato to Caloundra City Council was a shrewd move on Woolworths behalf. Council responded the next day with their own open letter in the papers. Much public bluster, hurried discussions and Council deliberation followed. The pressure was maintained by the people of Maleny and the TV and print media. Ironically, had the property owner (Cornerstone Properties Ltd) been willing to back out of the project at the actual cost of the land, Council, in all probability, would have agreed to purchase it and the whole matter would have reached a satisfactory conclusion. Cornerstone would have probably bought one of the other blocks of land for sale in town and the supermarket would have gone ahead in a better location. The campaign team proposed the possibility of a combined purchase scenario whereby funds were raised primarily from within the community, contributed to by Council and contributed to by Woolworths Ltd (as a show of goodwill which would have made their entry into the town in another location far easier). Unfortunately this proposal was not given sufficient carriage to attract the support of those in our town with the actual cash to achieve the purchase. (Around 15 months later sufficient pledged funds were actually raised within the community at the 12th hour, but by then it was far too late). A detailed presentation was made to councillors by members of the campaign team in June 2004. Despite an enormous effort by many in the Maleny community, no successful outcome was achieved, as Council determined not to commit any funds towards site acquisition. An approach was made to the Beattie Government to see whether they would help acquire the land for a park and visitor centre. The Queensland Government decided that they were not willing to help the people of Maleny and they declined to put any money into the site acquisition. Over a year later we saw Premier Beattie wash his hands of the affair with this letter. So, a stand-off phony war commenced and the development project was delayed while the possibilities of purchase were bandied around the various players. 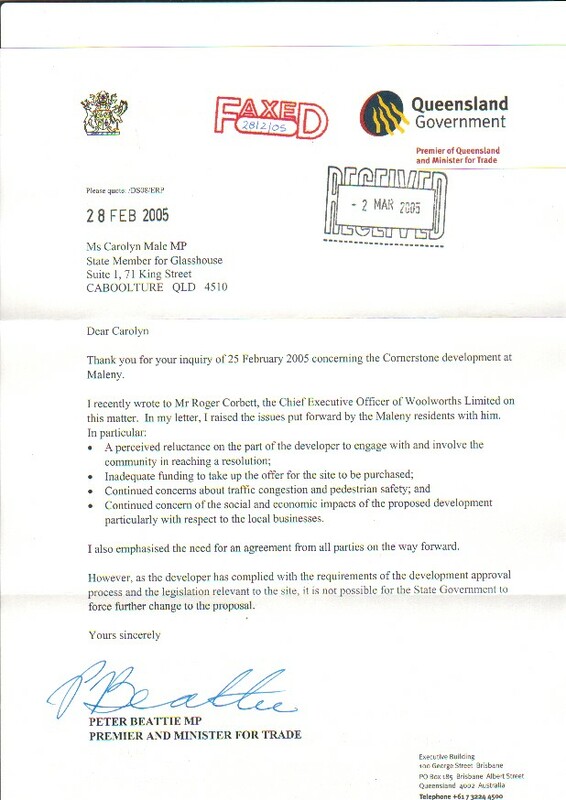 The Caloundra City Council at one stage in late June 2004 did indicate a willingness to be involved in a compromise deal, which could have seen Lot 1 retained as open space whilst seeing Lot 2 purchased by another developer for small scale commercial development. These negotiations eventually failed, due primarily to the very high, and well above valuation, asking price by the development partners, and Cornerstone's reluctance to see another commercial project on the site if theirs couldn't proceed. Also, please refer to the TIMELINE of events and listing of DOCUMENTS which will help to flesh out the above narrative, and read the opinion articles.